Tuesday, March 26, 2019 at 6 p.m. In 1631, the Dutch founded the first European settlement in Delaware called Zwaanendael, in what is now Lewes. Learn more about what we have learned about this colony through archaeology in this informative talk led by Alice Guerrant. Ms. Guerrant served as an archaeologist for the Division of Historical and Cultural Affairs’ State Historic Preservation Office for nearly 38 years. 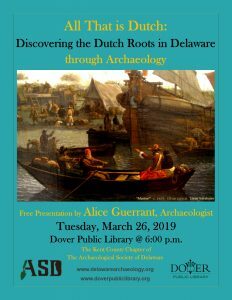 This program is sponsored by the Archaeological Society of Delaware. Please join us each month for an educational and interesting presentation of historical interest in and around Delaware, held on the last Tuesday of the month at 6:00 pm.